before the snow started flying. I had a lot of fun putting it together this Spring. I've really been using it! It's been great having a "garden central"
where I can keep all my garden tools, gloves, potting soil, etc. Instead of searching all over the place for them. Under the deck and sunroom is pretty dark and dreary. and the occasional raccoon potty. but that just looked silly and not to be taken seriously. there it was in all it's sturdy glory. I imagine it had been in someone's garage to use as a tool bench. old pots, a galvanized tub of my mil's, jars, seeds, and carriers. and try to avoid the raccoons! Now for some fun from last week. I wish I could feature all of you! takes us shopping where she finds this adorable mini hutch. shares her home "that speaks French". 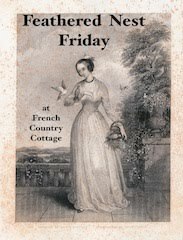 please go visit, her blog is full of wonderful French inspiration! Lezlee, from Prior came up with an "out of the box(springs)" idea for a window treatment. 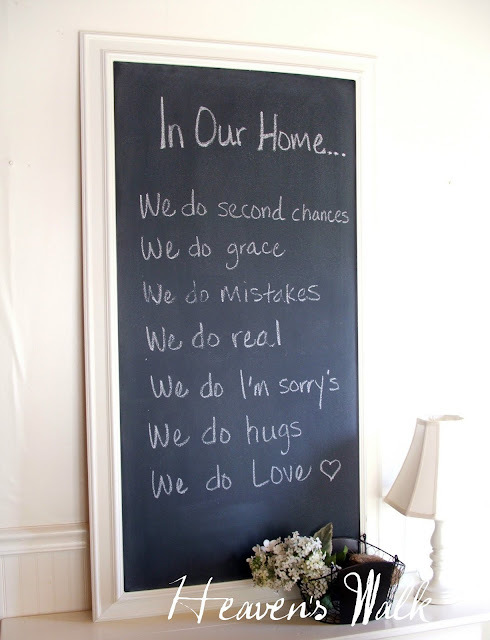 creates a wonderful chalkboard, with a perfect message! please grab the "featured on" button for your sidebar. or directions to a button on your sidebar. Now. What's been inspiring YOU? Oh Debra... that would make me want to garden!!! It's alllll gorgeous - I like the little yellow drawer!!! 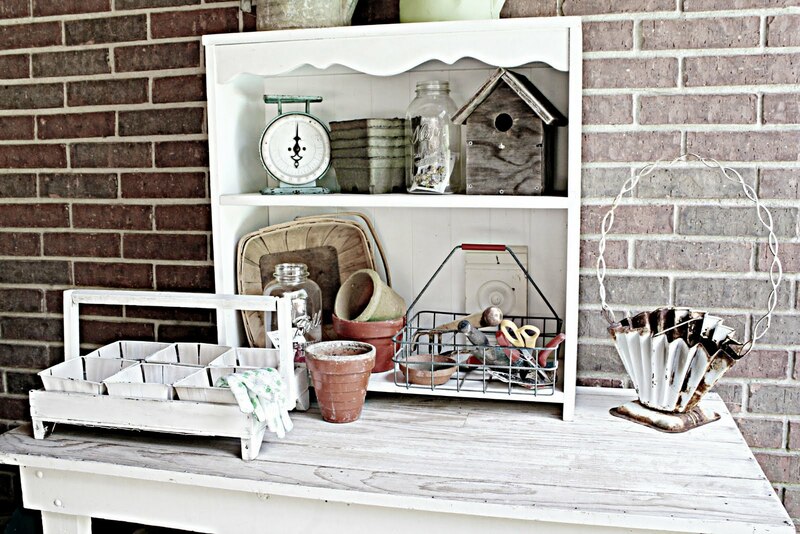 Your potting bench is so cool! Love that it's white! It looks like the perfect place to do a little gardening, sit and drink a little tea, and just relax and enjoy! I love the idea of using an old drawer as storage!!!! Saved that idea for future use! I recently put together a potting bench also and it has certainly relieved some of my gardening confusion!!! 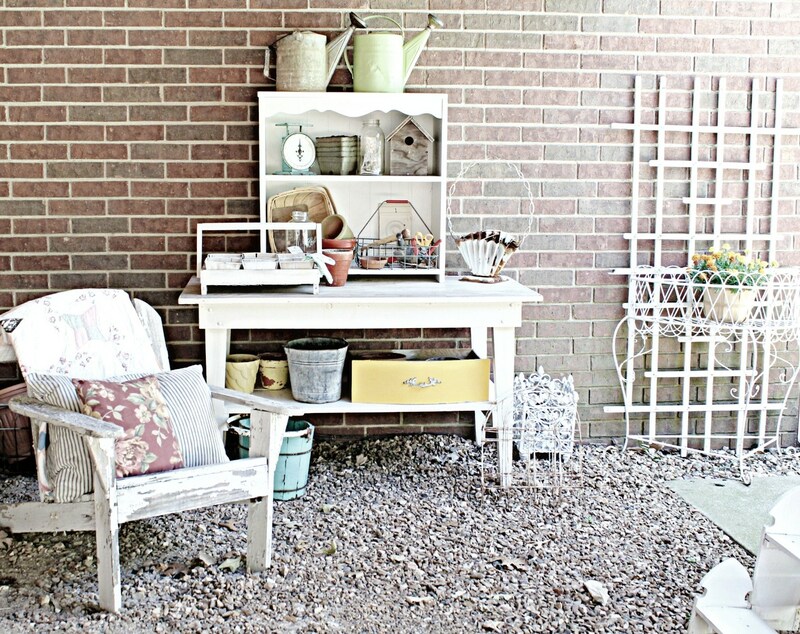 Oh your potting bench is so cute...and all the trinkets on it! Great place to have it...and I know about Racoons...one thing is they are bigger than you think they are! and stinkers!! oh, you lucky girl you! I have wanted a potting table forever! now I am really inspired- terrific! Debra, love your potting bench. Sure wish I had one. Thanks for hosting this party. Debra, I love your potting bench! It looks perfect there. I love your gravel area. I have been wanting a gravel area out back and hubs isn't convinced yet. He pictures the mower going alongside it and breaking windows. Ha. Thanks for linking it up at HSH and thanks for having us over to your delightful party! If my potting bench looked as good as yours, my yard would be looking much better. Love the sweet cozy area you created. Beautiful Debra. I would love to just hang out there. Thanks for hosting. I love your potting bench, I gotta get me one of those, I transplant my pots in the kitchen and is a total mess. Thank you for the inspiration! I love it! I think my favorite part is that yellow drawer underneath. How inspirational. I think it's time mine got cleaned up, it would be pretty jealous right now! The potting bench is perfect. You make me wish I had a place to put one! Thanks for hosting the party each week!!! 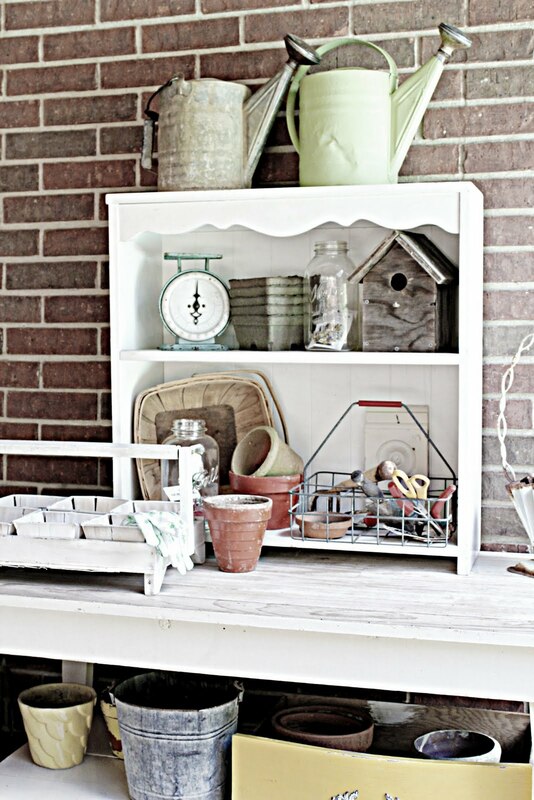 i love things that are pretty and functional...like your sweet potting bench...all linked up my friday friend! I could putter around at your potting bench all day! You've arranged it perfectly! Your potting space is pretty and practical, Debra! I love how you have it all arranged. The little caddy is so cute and I like the jar with the seed packet inside. I have my own little section of the workbench in the garage...I need to spiff it up! Thanks for the inspiration! Debra, that is one gorgeous potting bench!!! 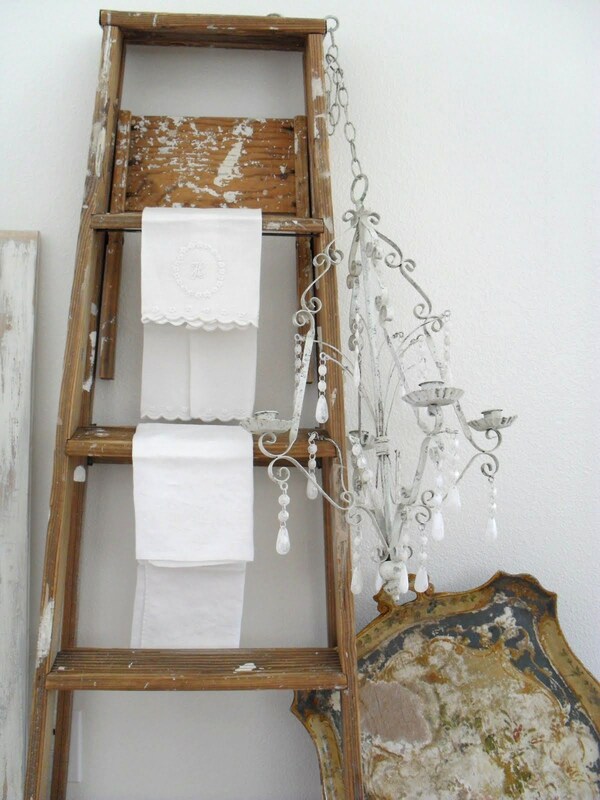 All of your lovely vintage touches are so perfect of course. :-) I have been so surprised by how much I use my new one too and I think hubby is glad it isn't just out there to be pretty to look at. LOL! Thanks for hosting Friday Friend! 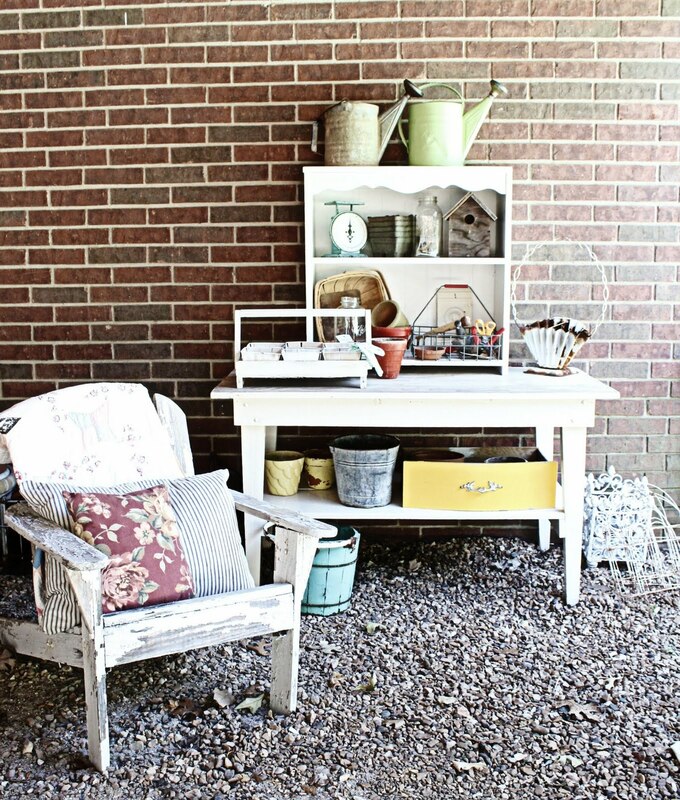 ...oh to have a potting bench would be divine!! 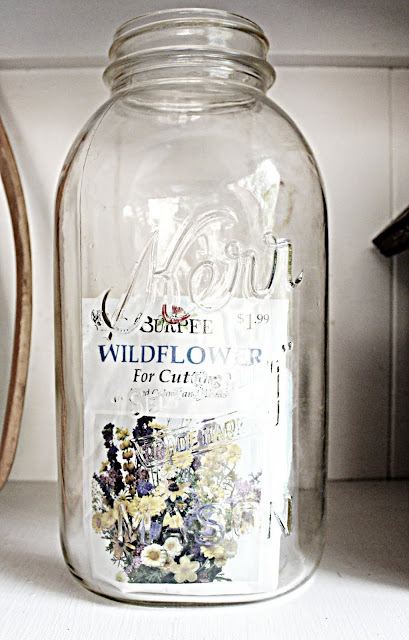 Happy Vintage Inspiration Friday dear Debra! Great potting bench, Debra! I love how you've got your stuff displayed on it ~ functional and very pretty! Debra--what a pretty little potting area! I wouldn't have thought to go under the deck either; it actually looks nice and bright under there! I wish my deck was taller now! What a perfect place for a potting bench! I need something like this! Thanks for hosting!!! Hi Debra! I love your "Garden Central"!! Thanks for hosting. Ok Debra, I am totally drooling over your potting bench! It is gorgeous! I love all of your wonderful accessorizes, such as your baskets, and the former dresser drawer, too! Now I want one:) Thanks for the inspiration!! I love your little potting bench. I'm happy you made use of that space! Your features? love that chalkboard! Debra, I love your potting bench. It looks so sweet with all your vintage decor on it! I've found some racoon poo around here lately too. We hear them running and chattering around the yard almost every night! They keep us awake! Have a great weekend. Hi Debra! Thank you so much for featuring my chalkboard! What a fun surprise! :) You are a sweetie! 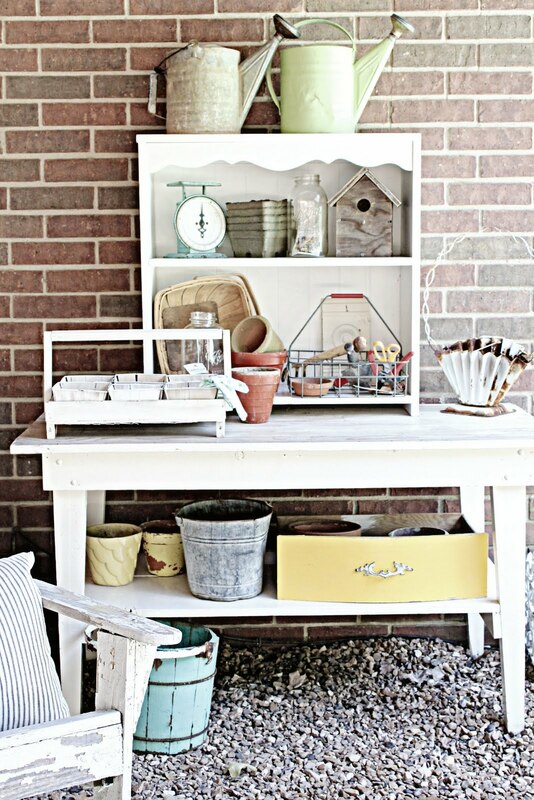 ♥ I am just adoring your wonderful potting bench and work area, girl! What I would give for a sweet little cozy place like that! 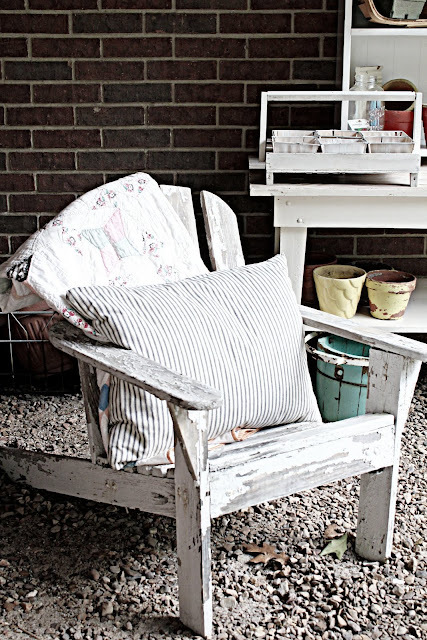 Love your vignettes on it and that chair with the pillows adds just the perfect comfy touch! Hi Debra! 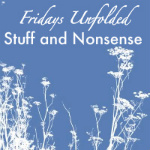 Wonderful features and thank you for hosting this fun party! 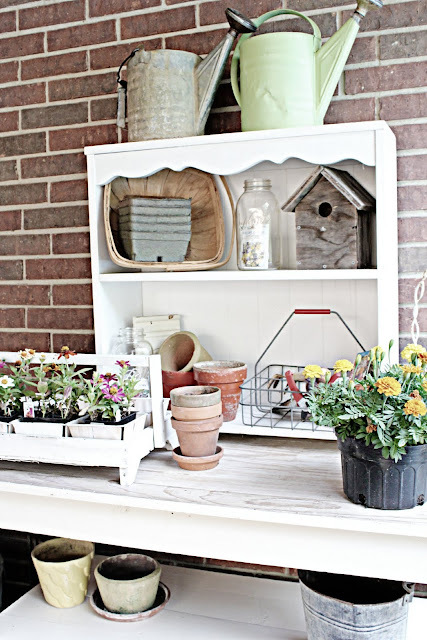 I would love to have an adorable potting bench like yours! Thanks for posting the wonderful features and hosting the party. Love love love your potting bench! Thanx for such a great party! I've always wanted a potting bench and now I want yours! ;-) I think my favorite part is that cute yellow drawer tucked in below. Or the little aqua bucket nearby. It's all good! Love your potting bench. I'll bet it's being put to good use, too. I noticed that vintage kitchen scale....great color....along with the blue wooden bucket. A fun place to relax and plan your garden. Debra, I like your vignettes on it and that chair with the pillows adds just the perfect comfy touch. It is really beautiful arrangement. 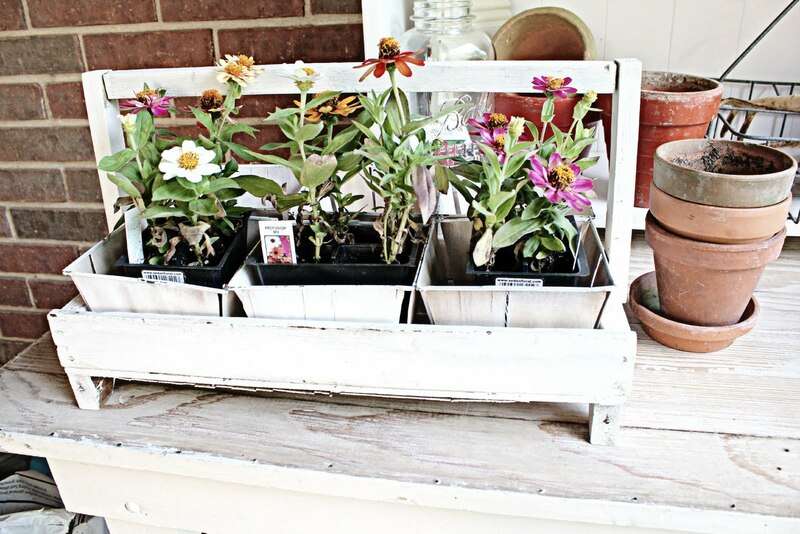 Cute potting bench, Debra! You always have everything looking so beautifully decorated. Wow, that box spring window treatment is definitely out of the box! Come by my blog...there's a treat for you! I love your potting bench. I've been wanting one so much but have yet to find the right thing to make one of. I'd say that table is perfect! My inspiration just skyrockets after visiting your Blog and Blog Parties! Oh Debra! Your bench looks amazing! I really need to do something with my back porch, it is a barren waste land! Have a great weekend! Hmmph...who cares what 50 ol' people say. I think it's a great use of a little hidden spot. 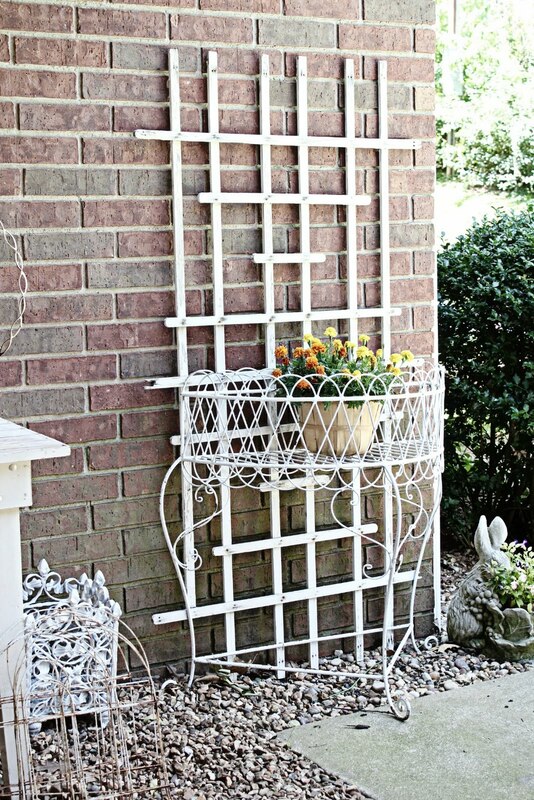 Why couldn't you trellis in the front part and maybe give it a sanctuary look...your neighbors wouldn't suspect a thing! Thanks for hosting another great party! Love your garden bench, it's beautiful! Looking forward to visiting all the vintage beauty in blogland. Debra, I love your potting bench. I used to have one and miss it so. Joining you for the first time. Many thanks for hosting. Debra you have turned this space into something garden magazines are made. Love every square in of it...and no commitees to make happy either. My genius friend. it was from a magazine! of them : ) Happy Friday! joining my show and tell! Love how you brightened up under your deck. I have a separate garden shed with potting bench but yours is much brighter and fancy looking! 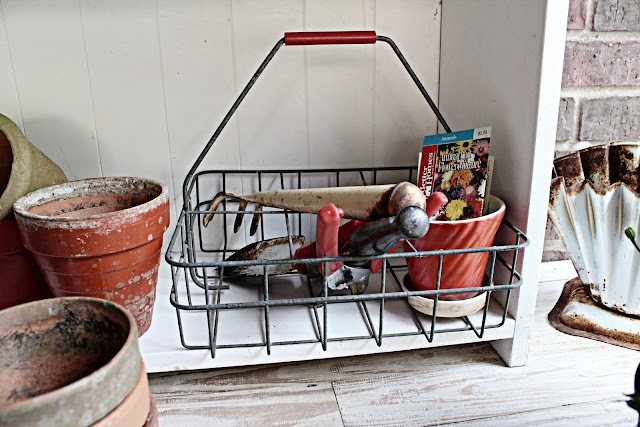 Love your potting area, looks gorgeous and useful! Have a blessed day dear Debra, HUGS! I am sending this to my friend Mary Ellen who just got a potting shed! You have created some real beauty here Debra!! Your potting idea is awesome. 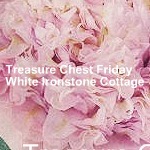 I like to appreciate you for sharing at Fishtail Cottage's Garden Party this week. You created real beauty in your blog. I'm glad you finally got your potting bench, Debra! I've been wanting one for ages, too!